Your trash can is like a small treasure chest to your little one. Take a peep inside and you’ll see all the colors and shapes that are ready for your baby and even your pets to nibble or even worse to swallow. Those not so beautiful shapes, sizes, and colors are definitely not something that you want near your little one. Sharp objects like opened cans, bones and even foul odor are things that are frequently found in waste bins. A perfect way to baby or dog proof your trash can is to invest in these Premium Quality Locking Trash Cans. Yes, it might be a bit expensive but I would rather feel safe than sorry. While there are some alternative methods to lock a trash can like this Bin Strap Garbage Lock the only problem you’ll face is to repeatedly unlock the strap when you dispose of the garbage. The easiest and most effective way to baby proof your trash can is to lock it away in a cabinet. While this method is highly recommended by many home owners, some of them find it inconvenient to regularly have to open the cabinet doors just to throw away the trash in the bin that’s been hiding away in the cabinet. And who wants to hide the trash can especially if you’ve got a stylish one that compliments your kitchen décor? Your other option is to invest a trash can with a lock. The lock will stop your curious child or pet from opening the rubbish bin, preventing its dangerous contents from becoming a play toy. With this said we’ve compiled a list of the Best Premium Quality Locking Trash Cans. The build quality is sturdy making it harder for pets to knock it over. And with the black finger proof coating (even if it gets knocked over) the ugly dents won’t show. Even though is sturdy it’s light enough to be moved around the kitchen floor. The protective guard on the back keeps it from unnecessary scratches and possible dents from the kitchen wall. The lid closes silently and this is because of the impressive Shox technology Simplehuman implemented in the springs. And with a 5-year manufacturers warranty, you can rest assured that you buy a good quality product that is pet and child proof. Perfect For Outdoors: While the Simplehuman Step Trash Can mentioned above is the absolute best dog proof trash can indoor use like your kitchen, the Suncast Resin Wicker (or as the manufacturers call, trash hideaway) is the best Premium Quality Lockable Trash Can for the outdoors like your patio. On a side note, not only will the Wicker look stylish outdoors but many owners confirm that they gladly placed the Suncast Trash Hideaway in their kitchen and don’t even look a bit out of place. The Trash Hideaway is the perfect solution for indoor and outdoor use. Locking Rubbish Bin: The Resin Wicker Hideaway boast with some awesome features making this Wicker the obvious choice for most homeowners, for a stylish outdoor trash hideaway. One of the most obvious features is its strong and tightly secured locking lid mechanism, making it impossible for your dog to open and grab a midnight snack. It’s also tall enough so your baby won’t be able to reach the top and open the lid. Even though the Simplehuman Slim Plastic Trash Can lack the diva style motion sensor like these Touchless Trash Cans we’ve previously reviewed it does its job just fine. Just like its older brother mentioned in spot number #1, it uses a foot pedal mechanism to open the lid. The Slim is made from durable plastic and with its sleek design and black coated finger proof finish the bin will complement any styled kitchen and even bathroom for that matter. You’ll appreciate the locking lid design that keeps toddlers out and garbage in. And with a light foot tap on the pedal, the lid open up instantly and stays open until you manually close it. And with the integrated Shox technology, the lid closes silently so you won’t disturb the sleeping persons in the house. The space saving slim shaped design will ensure that you can easily fit the Step Trash Can between two kitchen units without compromising floor space. 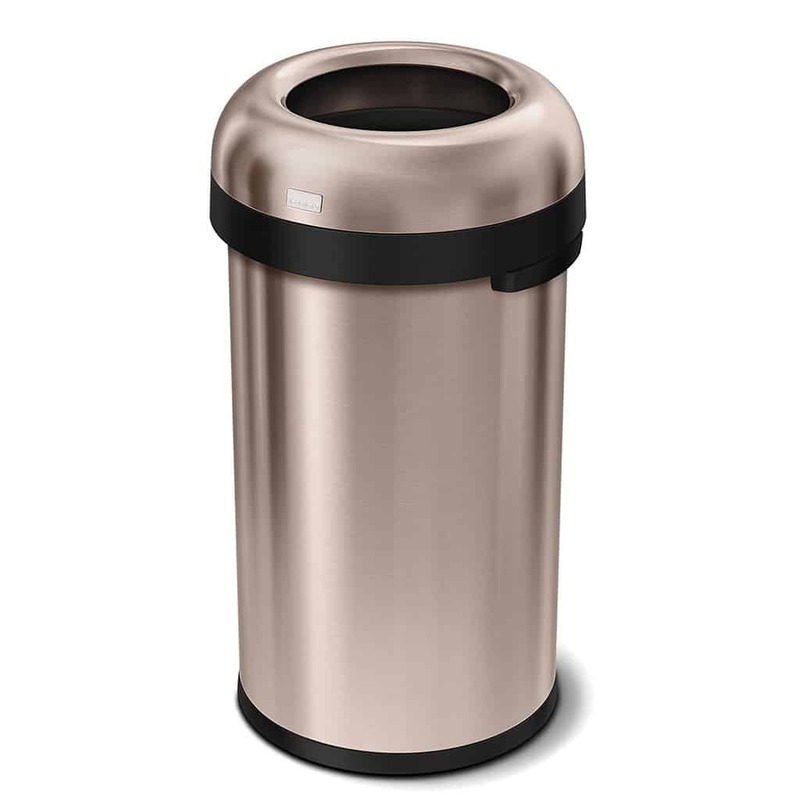 As far as I know, Simplehuman provides some of the Best Premium Quality Locking Trash Cans currently on the market. Looking for Trash Can that you safely tucked away inside a cabinet? Then the Under-Counter Pull-Out Trash Can for Simplehuman is the best choice for small department owners who have minimal floor space for those big flashy trash cans. Not only is it perfect for those who love a clean and minimal kitchen look but it’s another perfect choice to keep pets and small children out of the trash can. If space is not an option, you can even position it under water sink to keep your dog out and the smelling trash in. I like the Simplehuman pull out trash can for its excellent build quality and the moderate size to fit a small household. Should you decide to install it under the sink then you should be aware of all the plumbing under the sink cabinet. And if you have a garbage disposal operating under the kitchen sink then it is critical that the Under-Counter Pull-Out Trash Can be positioned at a safe distance from your disposal unit. Even though it seems a bit more complex to have a pull-out trash can installed but it’s a very effective dog proof and child proof trash can. To make it more secure you can even install a latch to make it impossible for snooping kids to open the cabinet. • Can be frustrating to frequently open the cabinet to dispose of the waste. The Sterilite Waste Basket is a Premium Quality Locking Trash Can design with a modern textured aesthetic. This garbage can feature a locking lid with a durable titanium pedal that will prevent pets and children from snooping in the trash. The entire lid will stay safe and secured to the base even if the wastebasket is accidentally pushed over. When you are ready to dispose of the waste a slight step on the foot pedal will release the hinged mechanism to open the lid a for hands-free trash disposal. • Be careful where you leave hot beverages. Be extra careful where you leave that hot cup of coffee, tea or hot chocolate. Their A curious hands can easily knock it over resulting in serious burns. • Return objects such as knives or glasses to cabinets as soon as you have finished using them. Objects such as knives, glasses, and porcelain are a recipe for disaster especially when left unattended for young children to have a go at it. • Never leave appliances plugged in. Appliances such as toaster, sandwich makers, and coffee machines should be immediately plugged out and put away and put high enough out of reach of young children. • Suitable for locking cabinets, drawers, closets, garbage bins, fridge, etc. • Adjustable Strap Allow adjusting (3 to 7in) to fit any size of appliance and furniture. • Easy to remove without leaving any mark and hole. • 12-Month replacement and refund guarantee.